It is September 2004 — the first day of school. More than a thousand people have gathered to accompany their children on the beginning of a new phase in their life. Masked terrorists, heavily armed with automatic weapons, ambush them and take them hostage in Secondary School No. 1. For three excruciatingly long days, children, teachers and parents are held captive in a gym; then come explosions and a shootout. What was to be a celebration of life ended with more than 300 deaths. 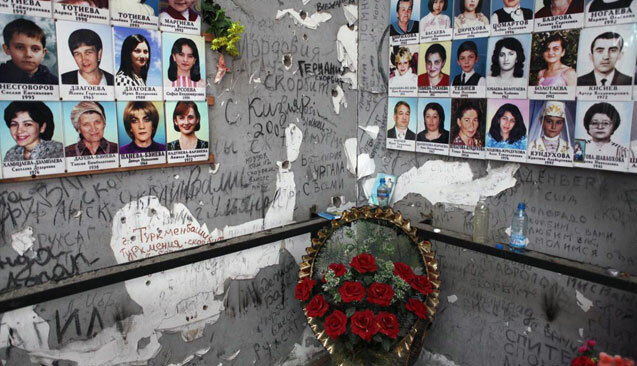 The name Beslan will be forever linked to one of the absolute worst atrocities to ever be committed in human history. Parched and weary, I enter Boris’ grocery store on Prospect Kosta — Vladikavkaz, capital of the Republic of North Ossetia. The suffocating heat does not help my appearance any; my shirt is filthy and soaked in sweat. A grey-haired man appears from the rear roam. It’s Boris. He lives in Beslan and will take me around the city. We drive through the Ossetian steppe, leaving the lofty peaks of the Caucasus behind us. Boris invited me almost at once; his wife nodded her agreement to a matter already long since decided. I sit in a red Lada without a seat bench, the window agape. View the gallery: What do Beslan children dream of? The Ossetians have not changed their hospitable manner one bit since the act of terror in 2004. Boris pours me a shot. “We don’t want to get drunk, but tradition demands it.” He peels garlic, breaks bread and raises the glass. A melody rings out — a hymn of praise dedicated to hospitality, to strangers whose presence brings riches into a home. Beyond dusty footprints, I have yet to leave anything behind. Moved, I soak up the heartfelt gesture and cringe when the firewater burns a bitter path down my throat. After three shots, tradition ceases with its demands. Behind the brick wall and grapevines they stayed. Three days of lying low and avoiding the street. Chaos was everywhere. Armed men, soldiers and citizens were everywhere. Who was to say that there weren’t terrorists among them? Large wooden planks block the windows of Secondary School No. 1. We open an iron door and enter the courtyard. The guard is asleep in the shed. We wake him before slinking through the ruined gymnasium. There are stuffed animals in every corner, a large cross and bottles of water. For three days, there was no water. A basketball hoop poses as a grieving reminder. Beslan seems well kept. We travel through the city on bike. The asphalt is new and the roofs solid. “That all comes from money received as compensation,” says Boris. But there is no price you can put on that kind of suffering. New plastic windows and a fence? A ludicrous tradeoff for children, parents, relatives and friends. We drive past the new mosque and restored houses on our way to the graveyard. Children are screaming as they play ball on a brand new field that opens up in front of us. The most modern tennis courts south of Moscow are surely in Beslan. Floodlights illuminate everything: Perhaps they are trying to bring light to the city’s dark past. “What do you consider normalcy?” I ask Boris. He caresses a tombstone. It could have easily been his kids. He ponders. The marble gravestones stretch out deep into the distance. They have tried to fill all the holes, with asphalt in the streets, with a memorial over the gymnasium. They have built playing fields to shield against brooding, and floodlights against darkness. But the holes in the souls run deeper still. You can sense it in Beslan. Boris takes me in like a father. He shares stories and thoughts with me, shares his time with me. His family did not lose anyone, but I can still see the deep hole lining his face.